Now we’re out the back of the Christmas doldrums and you've weaned yourself off the port and crackers you're no doubt looking forward to those first sunny spring rides. You’ve probably made a list of the rides you want to do in 2019, maybe even entered some of them already. It’d be great to turn up and ace them, right? So, what are you doing to get into shape? Most of us will just go out and try and get the miles in beforehand, and consider that our training. That’s no bad thing. But a bit of structured work added into the mix can add to to some useful fitness gains, especially if you’re starting from a fairly low rung on the ladder. And let’s be honest, most of us are. The fitter you are, the harder-earned those gains will become. What is it you’re aiming at this year? There are as many individual goals as there are riders out there. So we’ve teamed up with Cyclesurgery, and worked with sports scientist Elliot Lipski from Trainsharp, to put together a six-week training plan to cover training basics. It’s not specifically designed for any goal event, but whether you’re eyeing up a 100-mile sportive or even a local 4th Cat crit race you can make some meaningful gains by following this plan which includes a balance of strength and endurance workouts. Everyone’s busy these days, so we’ve limited this plan to two sessions and three to four hours a week with some optional workouts for those with a bit more time. You can start the plan any time you want, and you can do the work indoors or outdoors. We’ll be outlining the programme below and focusing in week by week. The training sessions we’ll be using for this six-week plan use training zones. The effort you're putting in on your bike is a sliding scale, from nothing at all to giving it everything you've got. To make it easier to understand training sessions, and to give them structure, effort is usually broken down into zones, with Zone 1 being the easiest and Zone 6 the hardest. See the boxout to understand what they mean. The training plan has six weeks of sessions, and we'll examine each of the weeks in detail over the next six weeks. Zone 1: This is a modern take on the old fashioned fat burning ride. The idea of riding in this zone is to encourage your body to become more efficient at using fat as a fuel source. Rides of 3 hours plus are most beneficial. Zone 2: The pace is now getting a little harder (although you should still be able to hold a conversation). Your body starts to use more carbohydrates and becomes less reliant on fats. Training in this zone can encourage your muscles to store more glycogen and help you to become more efficient as a rider. Zone 3: This zone is often refereed to as tempo - You can still talk, but in short sentences rather than a full conversation. Riding in this zone really helps develop fitness but you shouldn’t base your entire training programme around these rides: you need to do higher intensity work too. Zone 4: Things are getting serious now. Zone 4 riding is often referred to as Threshold. This is the maximum pace that you can sustain for 1 hour. Rides in this zone are aimed at increasing your Threshold Power. Zone 5: This is where the hammer really goes down. Riding in this zone is very hard on the mind and body. The benefits are that it causes big improvements in the amount of oxygen your body can effectively use during exercise. Zone 6: Ok, full concentration is required. This zone is all about maximum efforts of up to 2 minutes in duration. The efforts are short and very hard with recovery time in between. Riding in this zone pulls your threshold up but is very taxing on the body so you should not plan too many of these sessions into your weekly training programme. Above Zone 6: Anything above zone 6 is a flat-out effort – if you’re still thinking about riding in a zone you’re not going hard enough! Most people don't have any equipment for measuring how hard they're working, and it's not a necessity for structured training: all you really need is a bike. Given the descriptions in the boxout, you should be able to do a pretty good job of riding in a particular zone. If you know it's a Zone 2 day then that means going fairly easy, and not making a concerted effort to push on. If you have to do Zone 5 work then you should be going hard enough that you can't maintain the effort for more than a few minutes at a time. Your perception of effort is influenced by quite a few outside factors: how you're feeling on the day, how fresh your legs are, even what the weather's doing. Of the ways of measuring effort, it's the least repeatable. But on the other hand, it's free. In the Plan PDF we've included a table of the zones that includes a column for perceived effort: on a scale of one to ten, how hard should you be working in each of the zones? Your perception of effort might vary from the next person, but knowing that you have to ride at what feels like 6/10 can help keep your training consistent. And consistency is key: you should use the same method of measuring throughout, whatever it might be. Next step up is heart rate. You'll need a heart rate monitor, and some manner of displaying what it's reading. If you have a smartphone you can connect a Bluetooth heart rate monitor strap to it; If you have an ANT+ bike computer then you can use that with an ANT+ HRM strap. You'll also need to know your maximum heart rate because you use that to set the zones. You may have a good idea of what your number is already; if not, a suggestion for how to find out is in the plan PDF, although admittedly it's not masses of fun. Using your heart rate will give you a much more repeatable training experience than riding on feel alone. It's still affected by other factors, though, most notably your level of recovery. And there's a lag between starting a training interval and your heart rate increasing, so you still have to know what it feels like to ride in each of the zones while you wait for your heart to catch up. Power is the gold standard of training measurements. It's the way that most professional riders keep track of their progress, and it's an objective measurement of how hard you're working. The downside is that power meters cost a lot of money. Even the cheaper options such as the Stages crank-based system or a Powertap rear wheel are around £500; you can pay more than double that for systems such as Garmin Vector pedals or SRM cranks. Many indoor trainers are also able to provide you with an accurate and repeatable power reading. To work out your power zones you don't do a maximal test as you do with your heart rate. Instead you do a test to work out what's called your functional threshold power, or FTP. There’s an outline for an FTP test included in the training plan. 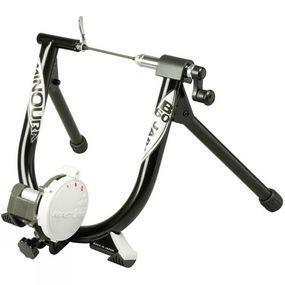 Budget: Minoura B60D £100 Not one we’ve tested here at road.cc but it’s a simple and solid trainer with three levels of magnetic resistance. Indoor training isn’t everyone’s cup of tea, but it does have some significant advantages when it comes to structured training. It’s not weather-dependent, which makes it more repeatable (and less likely you’ll stay home and hide under the duvet). If you’re pressed for time it’s a lot more efficient than heading outdoors. Also, if you’ve done your training indoors then when you head out of the door there’s no pressure: you can just enjoy the ride. If you’re not into riding indoors, there’s nothing in our six-week plan that you can’t do outside, and we've mixed up the sessions so that some of them are more suited to the outdoors anyway. If you are interested in a trainer, and you don’t already have one, See the boxout for some trainer suggestions to get you started. You can complete this six-week programme at any point in the year, but we're looking for people who are interested in getting a bit of extra fitness starting from next week. If you're thinking about following the plan and you're happy to share your feedback about how it's going, email us at fitness [at] road.cc and let us know. You can be any level of rider. and we'll probably even find you some fitness-related schwag for your trouble! Want to know more about getting fit, or have specific questions about training or nutrition on the bike? The road.cc fitness Q&A is making a comeback! We’ve enlisted the help of top fitness expert Ric Stern to answer your questions on a weekly basis. If you have questions, fire them at fitness [at] road.cc and we’ll get you some answers. Disclaimer: We strongly recommend that you consult with your doctor before beginning any exercise program. You should be in good physical condition and be able to participate in the exercise. road.cc is not a licensed medical care provider and represents that it has no expertise in diagnosing, examining, or treating medical conditions of any kind, or in determining the effect of any specific exercise on any medical condition. You should understand that when participating in any exercise program, there is the possibility of physical injury. If you engage in any part of this exercise program, you agree that you do so at your own risk, are voluntarily participating in these activities, assume all risk of injury to yourself, and agree to release and discharge road.cc from any and all claims or causes of action, known or unknown. Perfectly timed, I'll drop you an e-mail now. Need to build as custom workouts for Trainerroad. Hummm could be something for the long train journey next week. Great idea for those who need a little guidance. If anyone's doing the Etape this year, we have a monthly Etape specific training program on Youtube. I wish Strava would let you set up 7 zones, I can only do 5 on mine. My zone 1 isn't much more than coasting downhill, my zone 4 is going into z5 on the chart above at the top end, and 6 and 6+ are flat out, no more to give.